In a climate of financial insecurity my angel coins forms an emotional bond, aiding positive mental health and self belief, helping to restore confidence and self worth and purpose to life. It is an immortalised symbol to help creativity to flow and grow and protect. The mold for the coins is made from clay which I sculpt and bisque fire and then take this finished mold to the jewellers for casting in solid silver that is later hall marked. I am currently applying for my own hallmark which I intend to use on further editions. 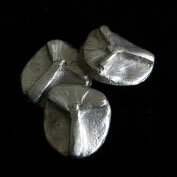 Each coin is lovingly hand finished when it returns from casting and following this I assign a unique reference number to ensure that there is a record of its authenticity. Many of my clients have the coins made into lucky charms and wear them as a necklace. The first angel coin was first minted in England in the 15th Century and was later used in the reign of Louis XVI where the coins featured guardian angels and the coins quickly gains a reputation for being ‘lucky’ after Augustine Dupre, the designer of the coins escaped the guillotine after being sentenced to death by Louis. By the middle of the nineteenth century, French captains refused to set sail without a French Angel in their pockets. Napoleon Bonaparte was said to have faithfully carried a French Angel Coin in his pocket. According to folklore, he lost the coin the day before he was defeated at Waterloo. World War I fighter pilots from France, Britain, and the United States carried the coins into battle with them. This tradition carried on among pilots long into the twentieth century: many US pilots continued to put faith in the coin’s protective powers during the Korean and Vietnam Wars, and during Desert Storm. Even the notorious Hermann Goering, head of the German Luftwaffe during World War II, believed so strongly in the power of the French Angel Coins, that he awarded them to German flying aces. The myth of the French Angel persists today, and many still carry them as talismans of luck and protection.